At BuzzSumo we love research and data. 2015 was a bumper year for people like us with the publication of over 20 new content marketing research reports. We ourselves conducted 5 major content marketing research studies ranging from analyzing 500m Facebook posts to analyzing the shares and links of 1m posts to a study of the most viral web articles. Research is important as it can provide insights into content trends and how we can improve our content to generate better results. We all have suspicions and instincts but it is much better to have data. We have been looking back at some of the main research findings this year and what this tells us about successful content marketing. The good news is that content marketing is becoming more sophisticated and teams are developing specific content strategies. In terms of investment in content marketing. Effective content strategies require a good understanding of buyer personas and how the content will support the various stages of the sales funnel. We are still in the early stages ourselves of using buyer personas but we have found that even a simple table such as the one below can help us create more focused content. There is an increasing recognition that content needs to be developed with a specific purpose in mind and be targeted at a specific stage or stages of the sales funnel. This is important as buyers are having less contact with companies and initial relationships are often built through content including webinars. As a consequence, content marketers are developing content to support the sales process. Below is a simple table highlighting how different types of content can support different stages of the buying process. It will come as no surprise that as more and more businesses are adopting content marketing the volume of content being published is increasing. As a consequence of increasing adoption the volume of content is increasing quite markedly. Again this is no surprise but here are some statistics that confirm what we are seeing. Some commentators feel the significant growth in content is leading to content shock. In essence–there is more content than we can consume or comprehend. Other commentators argue there’s no such thing as content overload, just filter failure. Others argue that there is not content overload in niche areas, however, there is a lot of content even in niche areas, for example, there are over 8m articles on ferrets on Google. There is not a normal bell-curve distribution when it comes to content performance i.e. where some content does well, some does poorly and most perform around a central average. 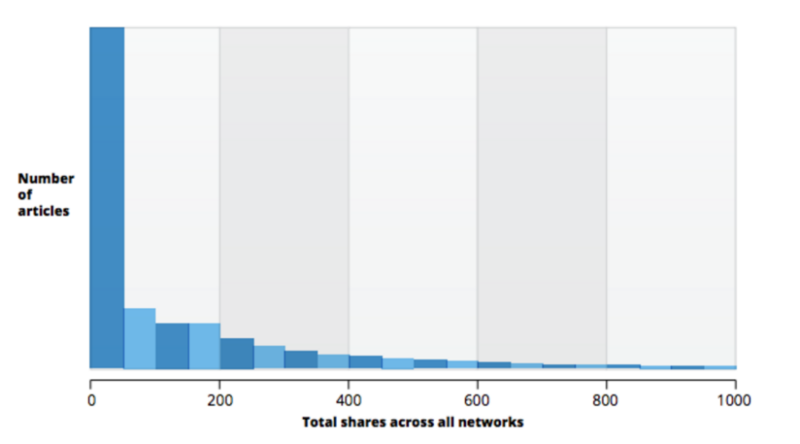 When it comes to shares and links, there is a very skewed distribution as we can see below. Most content gets relatively few shares and links, whilst there is a long tail of outlier posts that gather high numbers of links or shares. This skewed distribution means that averages can be very misleading as outlier high performing posts skew the averages. It is therefore more helpful to look at medians rather than averages. The reason for this is unclear. It could be the result of content shock, poor amplification or decreasing quality in large-volume areas. Many sites still achieve very high levels of shares, which suggests that sites that have built a large audience and which produce quality content can still attract thousands of shares and links. However, it is getting harder to maintain this success, as Buffer reported earlier this year. In our research with Moz we examined over 1m posts and found there was NO overall correlation of shares and links. The correlation of total shares and referring domain links was just 0.021 i.e. there was no correlation. This finding implies that people share and link for different reasons. Shares are also much easier to acquire than links. Link building is hard work that requires appropriate authoritative, evergreen and intrinsically valuable content. We found that long form, research-backed content and opinion pieces had a higher correlation, primarily because they acquired links as well as shares. It appears that content formats can have a major impact on the performance of content and whether the post gains shares and links. Some content formats such as amusing videos and quizzes tend to get lots of shares, but far fewer links. Quizzes may get well shared but they rarely get links. We found examples of quizzes with over 200,000 shares and zero links. The top performing content format for both shares and links is list posts. Lists starting with 10 remain the most popular list post for sharing. Below are some example posts from 2015. Videos also get very well shared, particularly on Facebook. Whilst there has been a significant growth in the volume of content published, most content is short form content of less than 1,000 words. However, our research this year found that longer form content outperforms short form content. Long form content of over 1,000 words consistently receives more shares and links than shorter form content. Images really do have the power of a thousand words and can be the difference between high and low performing content. Images have a significant impact on social networks and in web articles. Image posts on Facebook get 179% more interactions than the average Facebook post. One form of content that does particularly well is ‘picture list posts’. These posts combine the power of lists with images and curation. It is a triple lock benefit. ‘Picture list posts’ have viral potential and many of the most viral posts were curated images. Here are some examples of viral picture list posts. Our research this year confirmed that viral posts are outliers, even on popular sites such as Huffington Post and BuzzFeed. The top posts typically get two or three times the shares of the third and fourth most popular posts on the same site. We can see these four elements repeated in many examples of viral content this year. For example this post below combines many of these elements eg beautiful is the emotional element, sentences is the content element, and the format is a list post. We can see further examples of how viral posts use these four elements from surprise and quizzes to love and fitness below. The growth of Facebook continues to shape social sharing and website traffic. Posts published between 10 and 11pm local time received 88% more interactions than average post. Posts published on Sunday get 52.9% more interactions than the average Facebook post. Posts ending with a question in our survey received 162% more interactions than the average post. Content marketing is an increasingly important part of B2B marketing. The top rated B2B content according to Top Rank Marketing are case studies (65%), blogs (62%), webinars (63%) and “white paper” research reports (59%). One example of high performing B2B content we identified this year is regularly updated reference content. A good example is Moz’s ‘Web Developer’s SEO Cheat Sheet‘. Started back in 2008 this has become a core piece of reference content and was the most shared content on the Moz site this year by some margin as we can see below. When it comes to distribution of B2B content LinkedIn remains the most popular platform. 94% of B2B Marketers Use LinkedIn for Distribution. LinkedIn is not only the most popular platform for B2B marketers but appearently the most effective. But research from Buffer has found that business publications get the most social media traction on content they share on Tuesdays.We have also found that content published on a Tuesday gets the most shares on average. There is clearly a lot of scope for improvement as the Content Marketing Institute discovered in their recent survey on 2106 benchmarks for North America. In terms of goals for 2016 we are seeing a shift in emphasis and more focus on business results. Over the last six years, the CMI have found that B2B marketers consistently cited website traffic as their most often used metric. This year, however, they were asked to rate metrics by importance. 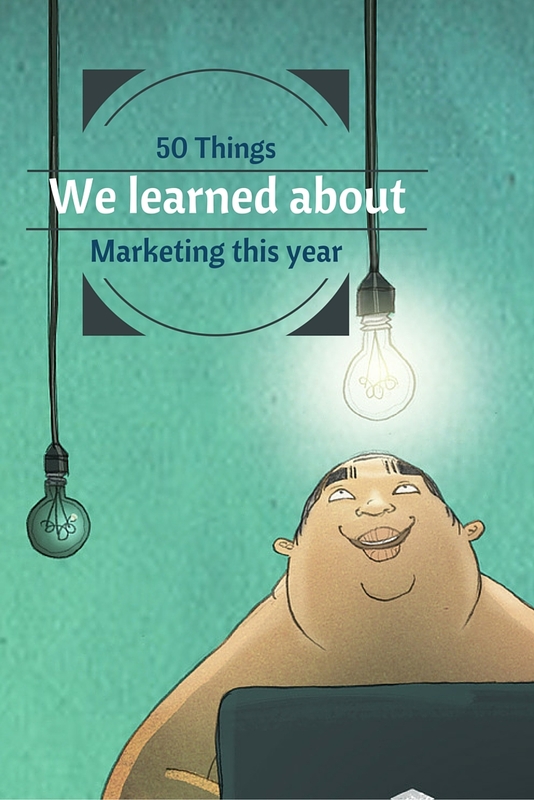 Hopefully the content marketing lessons we have learnt this year will help you in 2016. Did we miss any key lessons you learned this year? Let us know. Very informative post Steve. I especially loved the “picture list post” idea. I think services like MSN Travel etc have been using the technique for years plus I can imagine it helps people stay on a site longer. May need to incorporate it into my own content strategy in 2016. Besides View and clicks on links in content, how do you measure the success of your content since not many people share and like. How do measure ROI of your content ? Scott, you need to dig into Google analytics and set up conversion goals. Once you have those set up you’ll be able to understand how many conversions you’re getting, how much $ each conversion generates, and what content the customer interacted with on their journey towards conversion. This allows you to determine the value (or ROI) of specific pieces of content. If a blog post generates 10 conversions and each customer is valued at 10 dollars, but only one lead becomes a paying customer, you can say with confidence that the blog post generated $10 (and who knows what the Life time value of your customers are). For a car company the life time value is much, much higher. This is a very simple way of looking at things and by no means the only answer. Impressive content. The surprise was “Social shares do NOT build links”. I can understand that there is no direct correlation but my guess is that content shareability is still a major measurement of how well your content is doing. You have to be careful here Charlie, the system is easy to game. Yes, shares are a sign that are indicative of how well content is resonating with your audience, but read this lovely article about the importance of measuring referral traffic from social instead of social shares, I think you’ll find it useful, I know I did. Remember, people randomly share stuff just to seem smart…The real question is are they engaging? And are those engagements leading to more traffic (new and returning). Pulse? groups? company’s page? your own profile? else? Thx for another great post! Awesome Post! Thanks For Your Insight. Excellent work as always guys. I’m just missing keyword research. I like to have a list of keywords that people use (not just what client ranks for) to refer back to when creating content later. Thanks for the insights. Need to change my strategic plan. Will make it work better for me. Thank you.